Two big celebrations going down tonight at The Blake Hotel. The Come Up Show’s 9th anniversary (congrats to the fam!!!) as well as Blake C performing in support of his new project “F.A.I.L.U.R.E.” (congrats to the fam!!!). Should be a dope night! 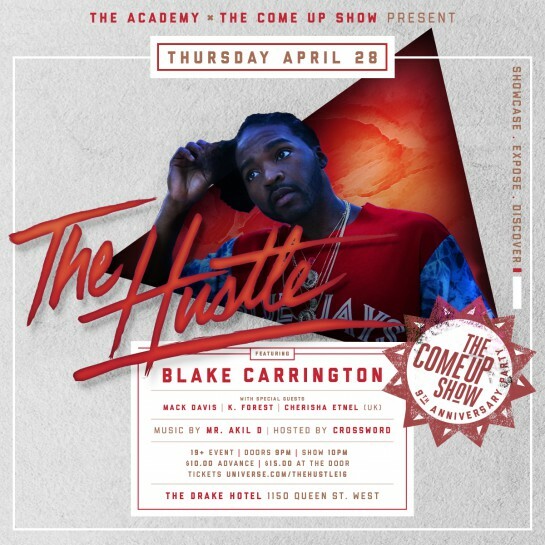 The 9th Anniversary of blog and radio show The Come Up Show will pair up with The Hustle tonight to celebrate the new album from Toronto’s Blake Carrington who has just released his LP, photo book, and short film entitled Failure. It’s been an emotional and challenging past 4-years for Blake Carrington, while raising a young family as a single father, Blake has continued to push forward with his music and overall creative passion. Between Toronto and Los Angeles over the past few years, Blake was able to see first hand the work ethic of US artists and business people he met while in Los Angeles, and combine that with his drive and energy as a buzzing Toronto artist, to bring together his current team to execute a tri-media project surrounding Failure. Toronto singer/rapper Mack Davis will also appear giving a look at some new music, and Brampton based singer K. Forest will give a first look at his live music that has recently received positive coverage (NOW Magazine’s R&B One’s To Watch) and drawn comparisons to soon to be stadium filler Bryson Tiller. UK based alt-R&B singer Cherisha Etnel will kick-off the evening, as she will appear a week later during Canadian Music Week. Been checkin’ for this dude since “Smooth Criminals” with Raz Fresco back in 2013. Can’t reach the show tomorrow night but am looking forward to taking this one in. ShaqIsDope’s long-awaited mixtape, Black Frames, Is finally here.The Toronto rapper delivers a hefty follow-up to his breakout mixtape Early Beginnings:The Shaquille Baptiste Story. The 12-track project focus on SID trying to maintain his moral integrity. Although he don’t consider himself above temptations, SID tries to pay close watch on his spiritual temperature. Songs such as “Innocent Youth” and “Stay Focus” proves how vulnerable we all are to temptation but we have to reminds ourselves of the damaging consequences of moral failure. Listen to Black Frames below and be sure to catch ShaqIsDope live at the Opera House with TY Dolla Sign on April 29. Shouts to Tanika throwing down last Friday on q on what was a tough day for all of us! “Soul Run” drops May 10th. Tanika Charles delivers the goods in Studio q with this performance of “Two Steps” from her debut record, “Soul Run”. Two legends in the game connect for what looks to be a one-of-a-kind theatrical experience. From what I can tell it’s like the one-woman-show meets hip-hop. And you know you can’t have hip-hop without the DJ. Really looking forward to this one even though I guess I don’t qualify for the youth price anymore. Gawd damnit! The theatrical run starts this Friday so get your tickets now and peep the full breakdown below. Shouts to the queens! 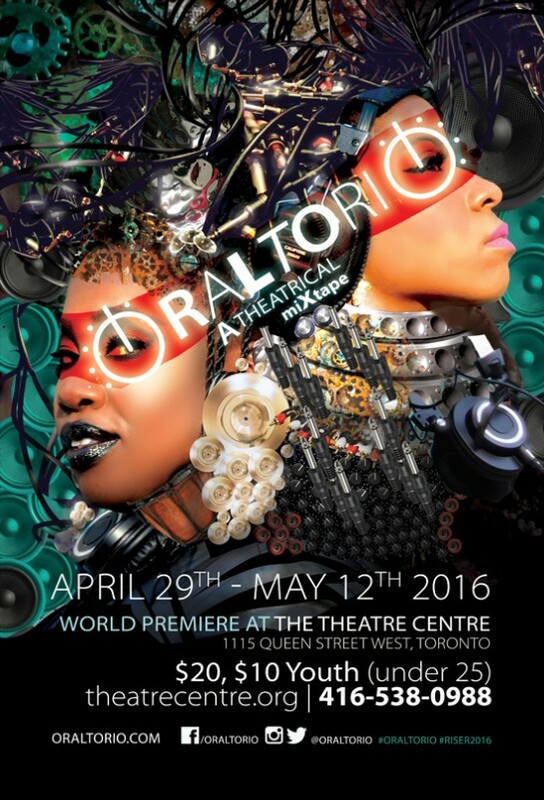 April 11, 2016, TORONTO – MotionLive Collective is pleased to present the world premiere of Oraltorio: a Theatrical Mixtape as part of The RISER Project 2016. The RISER Project, the collaborative producing model for independent theatre, returns to the Theatre Centre (1115 Queen St W) for the second time this Spring, Oraltorio: a Theatrical Mixtape runs April 29 – May 12, 2016 (opening April 30). Oraltorio: a Theatrical Mixtape is a coming of age story that traces the personal and collective journey of Northside-born girls as they grapple with identity, migrate through their histories, and manifest their lineages through ancient, contemporary, and Afro-futuristic soundscapes; finding the multi-layered voices of the B Girl and the DJ, as the traditional storyteller and drummer are reborn in their beats and rhymes. The piece is a multidisciplinary insight into how women’s voices – musical and otherwise – have been silenced. Oraltorio: a Theatrical Mixtape is a spoken word opera that remixes theatre, music and spoken word, bringing together a piece as insightful as it is entertaining. The piece riffs on music, race, gender, culture, memory, otherness, resistance, ritual, silence, survival and inheritance through its two characters, exploring the historical silencing of Black and women’s voices, and the intertwined revolutions and resistance signified by music and oral culture in the African Diaspora. Oraltorio: a Theatrical Mixtape is written and performed by playwright, poet and emcee MOTION and composed/mixed by DJ, composer and beat maker L’Oqenz. It is directed by Mumbi Tindyebwa. Oraltorio: a Theatrical Mixtape is made possible by Toronto Arts Council, Ontario Arts Council and Canada Council for the Arts. Catching up with that gurl Tanisha and her March Music Mondays series. Ya ya I know. It’s end of April. 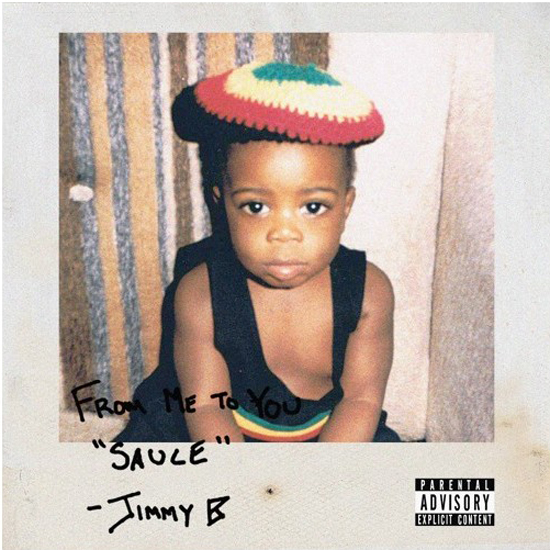 Overall…a solid introduction to a new singer in the city. Week 4 of March music with Tanisha, every Monday in March releasing new sound on a new wave. Frozen is the forth of 4 new songs scheduled to be released every Monday in March, featuring Junior Ahh. 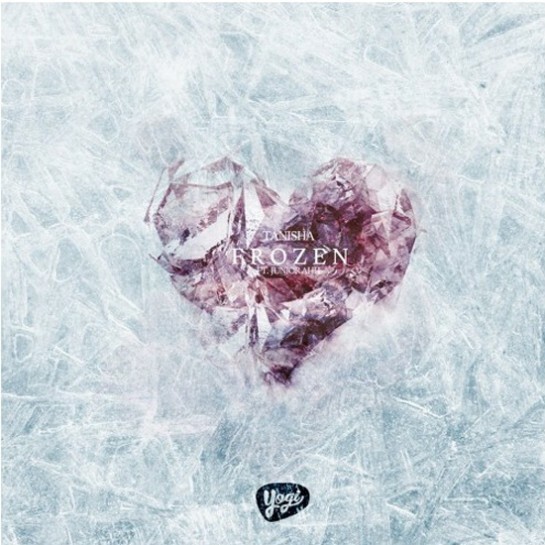 Produced by Kaz x JDI. The songwriter in Tanisha has allowed her to collaborate in writing and co-writing with producers, engineers and artists alike. She has been perfecting her craft day in and day out, taking from these various and diverse experiences. 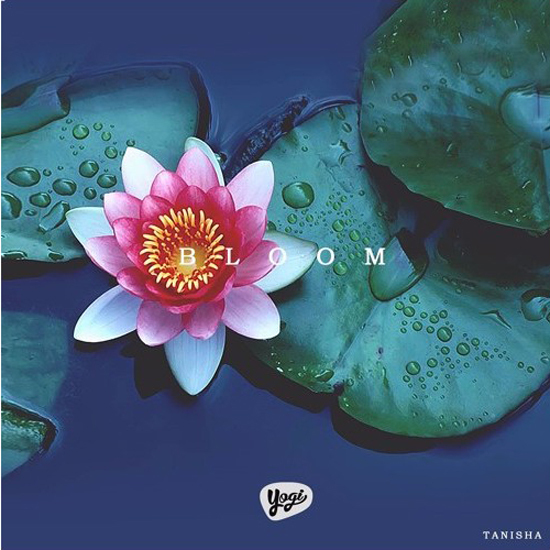 TANISHA’s soulful atmospheric sound rooted in r&b continues to challenge the current sound of female vocalists. Week 3 of March music with Tanisha, every Monday in March releasing new sound on a new wave. Bloom is the third of 4 new songs scheduled to be released every Monday in March, engineered and produced by Yogidaproducer. The Leader of the New School, Church Chizzle (@churchchizzle) is back with some really dope, introspective hip hop. This time, the Toronto native teams up w/ Ariel Bialski (@heightsbeats), a dope producer out of Warsaw, Poland to give you this hard hitting record, chronicling the up’s and downs, the majority of up and coming artists know too well. 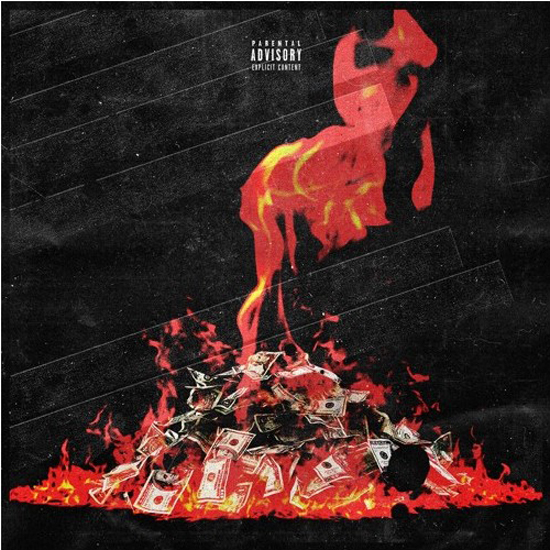 “All Your Money” serves as the first single off Young C.H’s highly anticipated EP, “The Prophecy”. Take this in and stay tuned! 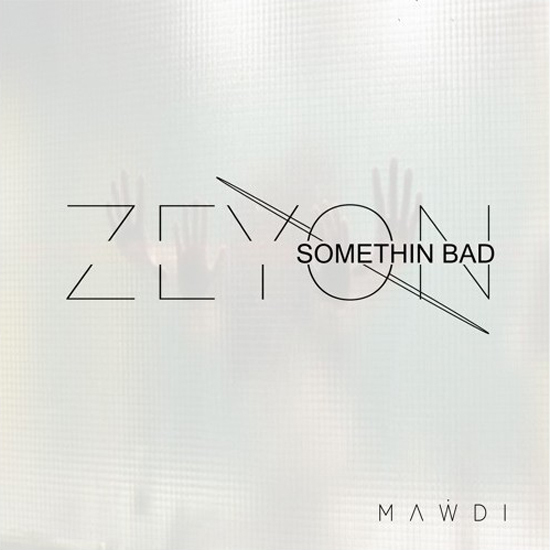 That dude Zeyon back with a new one. Thank you for all the support and love for my recent releases. Here’s another one for the ladies.